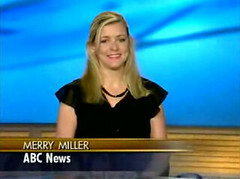 Merry Miller is the Senior Programming Director for The Learning Annex in New York, USA. She was named as one of the 40 “rising stars” in 2007 by Crain’s magazine and is a former Miss Dallas. But that’s where this “rising star” starts to fade. In late July of 2007, Merry conducted a poorly done interview with Holly Hunter on ABC News Now’s segment “What’s The Buzz.” Since its broadcast, the disastrous interview has been heavily viewed on YouTube and other online video sites. Not only were the interview questions awful, but for some reason Merry decides to phonetically read off the teleprompter – like a child. She also gives the wrong month for Holly Hunter’s show premiere (June instead of July) and accidentally encourages viewers to go to nbcnews.com not ABC News.com. Merry Miller, welcome to the TV Disaster Hall of Fame! I’m sure NBC loved the plug.